Heat the oven to 400°F. Stir the ricotta cheese, Parmesan cheese, lemon zest, lemon juice and black pepper in a medium bowl. Beat the egg and water with a fork in a small bowl. Sprinkle the flour on the work surface. Unfold the pastry sheet on the work surface. Roll the pastry sheet into a 10x12-inch rectangle. Cut off a 2-inch strip crosswise to make a 10-inch square, reserving the strip. Cut the pastry square into 25 (2-inch) squares. Cut the reserved pastry strip crosswise into 25 strips. Place about 1 teaspoon cheese mixture in the center of each pastry square. 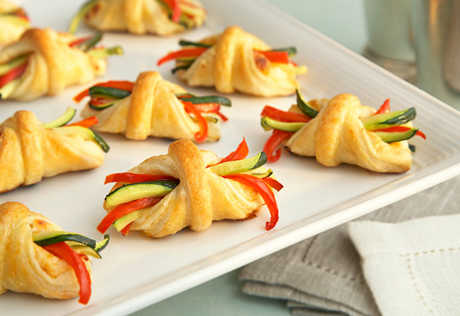 Arrange the vegetables diagonally on the pastry squares on top of the cheese mixture. Fold 2 opposite corners to the center over the filling and press to seal. Place the pastry strips crosswise across the centers of the filled pastries. Wrap the ends of the strips around the pastries to meet in the back (dot the back with water) and press to seal. Brush the pastries with the egg wash. Place the pastries, vegetable-side up, onto 2 baking sheets.